I wonder if any of our pressed glass experts (Pamela?) can help me with this. One often sees the Walther Muschel soap dish on ebay; the one with the mermaid with upraised arms and the soap dish sticking out in front of her. 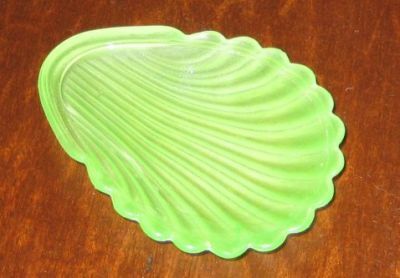 Pamela actually has one on her website with the shell balanced on the base, as it was meant to be, but usually they seem to have lost their shells. 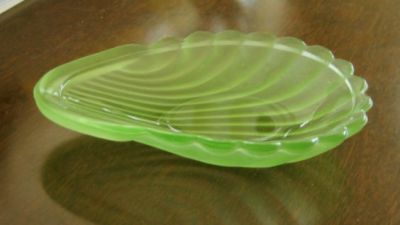 I have a green (uranium glass) shell, which looks to be very similar glass (colour and fluorescence) to my Nymphen pieces, and I am wondering if it might be a Muschel shell. However, I can't see from the Muschel pictures whether it is the right size and shape. Can anyone tell me what the dimensions of the Muschel shell should be? I've got the green and recently also a shiny pink one - going to measure them this afternoon and returning back to you later. Leni PLEASE post a picture of yours! I've never seen the real Muschel, only pictures. You don't realise the size of it in a picture! How big is the piece, overall? It must be really big!